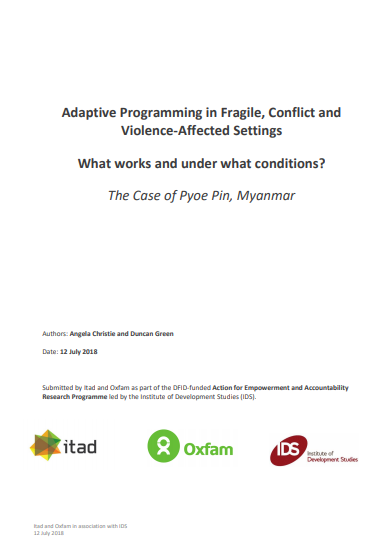 This paper examines adaptive approaches in aid programming in a fragile, conflict and violence-affected setting (FCVAS), namely Myanmar. A combination of desk review and field research has been used to examine some of the assertions around the ‘adaptive management’ approach, which has arisen in recent years as a response to critiques of overly rigid, pre-designed, blueprint and linear project plans. This paper explores if and how adaptive approaches, including rapid learning and planning responses (fast feedback loops and agile programming), are particularly relevant and useful for promoting empowerment and accountability in such ‘messy places’. environmental concern. To achieve this, Pyoe Pin supports a flexible number of issue-based programmes (IBPs) currently covering education, health, fisheries, forestry and extractive industries. Our field research focused in particular on the fisheries IBP, which is considered by Pyoe Pin to be ‘one of the first examples of public participation in state-level policymaking in Myanmar’. A field visit to talk with officials, local NGOs, politicians and fishing communities added considerable insight and texture to our understanding of how Pyoe Pin works. Our meetings revealed an organization deeply embedded in relationships of trust with ministers, parliamentarians, civil society organizations and fishing communities, and using those trust relationships to facilitate significant progress in fisheries reform, which in turn is leading to widespread improvements in the lives of small-scale fishers.